: Axiom Education offer UKVI approved English Language Classes IELTS LIFE SKILLS Level A1 & B1. These are for those students who are applying for UK Settlement visa/Marriage Visa/Spouse Visa/Civil Partner. If you are not sure what your level of English is, an assessment can be given by a teacher from Axiom Education at one of the enrolment sessions. They will then advise you about your level and, if appropriate, suggest a suitable class according to your requirement. 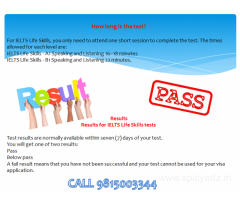 We have experienced faculty for IELTS LIFE SKILLS LEVEL A1 students. We provide them study material which is prepared by our experienced staff which will help students to achieve first class passing marks which is required by UKBA to log UK Settlement Visa. • We guarantee that we will make you achieve the desired Level so that you can pass the UK visa English test. So many students have passed this test through us and have secured their Visa's. We assure 98% success rate because of our training schedule. Please visit our offices in LUDHIANA or call us for more information anytime.